Dan Robbins, the inventor of the paint-by-numbers kits, has died aged 93. 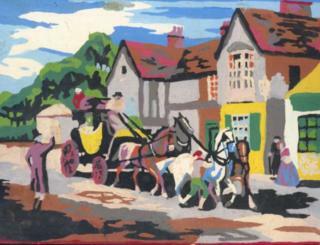 His kits inspired generations of budding artists to pick up a paintbrush and create multi-coloured wonders. Here, BBC News website readers share their artwork and stories about how the method helped them. I was only 10 when I did them, so they aren't exactly brilliant, but they are 64 years old and vintage. On the reverse of 'Coach and Horses' is a handwritten note from me to my aunt which reads; "Dear Aunty Bett, if you don't want one of these two pictures, (especially this one) will you send it back please, as Martyn wants one (especially this one). Tons of love and x's. From Marilyn. P.S. Happy New Year." 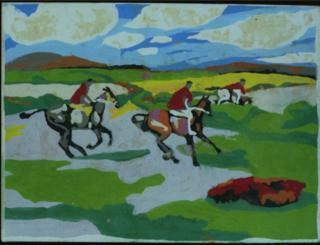 This poignant note suggests that I had been sent the 'Painting-by-Numbers' kit with a horsey theme for Christmas 1954 - maybe sent by my aunt in London and I was now sending her back my completed paintings of 'Coach & Horses' and 'The Hunt' in the New Year, which I had done during my Christmas/New Year school holiday at home in rural Staffordshire. My brother Martyn, then seven, had clearly not wanted to part with 'Coach and Horses'. As kids in Glasgow just a dozen years after the war we spent our time between lessons drawing war scenes. We learned how to draw tanks, planes and ships and soldiers. Every thing had to get blown up in the end. Because we were kids, sound effects were obligatory. So not too many years later this acting out was followed by the serenity of painting-by-numbers. As I think back on it three score years and some later, some disparaged it because it was about copying and there was no originality, but like learning how to use tracing paper it allowed you to develop a kind of muscle memory. It taught my young mind the discipline of process. Painting-by-numbers literally saved my life when I had a breakdown last year. I could barely function and my anxiety was through the roof. I was crying all the time and everything felt like an overload. Painting-by-numbers helped me to heal and gave me a break from the pain I was in. The act of painting each shape with a colour and being able to shut my brain off except for painting within the lines made such a difference to my recovery time, and I credit it with getting me to where I am today. 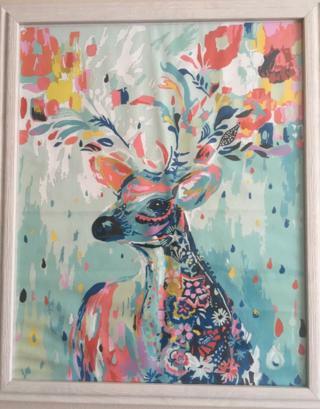 I chose the image because I like animals and the colours were attractive to me. There is also a slight sadness in the deer's eyes which spoke to me. I believe this image took me about three weeks to complete, doing about one or two hours a day. It was my first adult paint-by-numbers kit. I used to do them as a child. I do a little bit of drawing and I like the idea of being able to paint but don't feel confident enough to start a picture myself from scratch. I like the fact that all the hard work is already done with a paint-by-numbers kit, and at the end you know the image will be beautiful. I framed the painting I finished and placed it on my wall to remind me of what I did, and how I overcame that difficult time. Image caption Melissa D Matthews created this artwork as an ode to painting-by-numbers. She says: "I made this look like a paint-by-number and left the corner as if it had not been finished". I painted this in 2014 when I was in an art class at university. I went back to university as a non-traditional student in my 50s (and as a grandmother) to get a degree in Geography and Planning at Bloomsburg University. While I was there I also managed to get a minor in Art Studio. I loved doing art as a child and remember fondly the original paint-by-number sets. 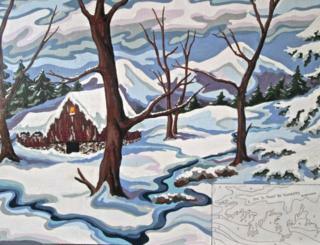 I gave the painting to a friend of mine who is a native of Florida, since she never gets to see snow. We had both worked together in a photography and framing shop and enjoyed framing paintings. I picked up a painting-by-numbers kit for the first time in 2011. This was my first time trying this type of craft. I was totally shocked how beautiful it came out. I loved it then and I love it still. 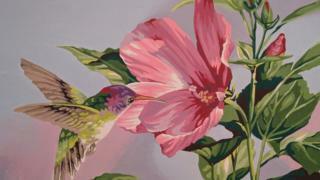 I selected that particular paint-by-number kit because I loved the hummingbird and the vibrant colours. I just got a new paint-by-number kit from my youngest daughter for Christmas this past year. It's a Japanese garden landscape. Just found my paint brush set and I'm getting ready to begin this new adventure. My two sisters and I were gifted with a variety of paint-by-number kits in the late 60s and early 70s. Paint-by-numbers were one of the many thoughtful and fun presents we received over the years. I could spend hours on a painting project and I think it helped develop my attention to detail and perhaps inspired some creativity. I remember being thrilled at the process of bringing paintings to life. Sadly, I don't have any of my completed projects. My thanks to Mr Dan Robbins for creating such a delightful way to build the confidence of us youngsters.